, a very learned and celebrated prelate, the son of Nathaniel and Mary Taylor, was born in the parish of the Holy Trinity in Cambridge, where his fatin T was in the humble station of a barber: and was baptised Aug. 15, 1613. He was educated from the age of three to that of thirteen at Perse‘ s free-school in Cambridge, and then entered a sizer of Caius-college, in August 1626, under Mr. Bachcroft. In this society he took | his degree of bachelor in 1631, and bishop Rust says, that as soon as he was graduate, he was chosen fellow. The improvement which he made in his infancy was now followed up with increasing assiduity; and to such an extent had he carried his theological studies, as to be thought worthy of admission, like Usher, into holy orders before he had attained the age of twenty-one. About the same time he took his degree of master of arts, and removed to London, where, being requested by his chamber-fellow, Mr. Risden, to supply his turn, for a short time, at the lecture in St. Paul’s cathedral, his talents attracted the attention of archbishop Laud, who preferred him to a fellowship at All Souls college, Oxford, “where he might have time, books, and company, to complete himself in those several parts of learning into which he had made so fair an entrance.” Into this fellowship he was admitted in January 1636; but, as Wood remarks, it was an arbitrary act, contrary to the statutes. 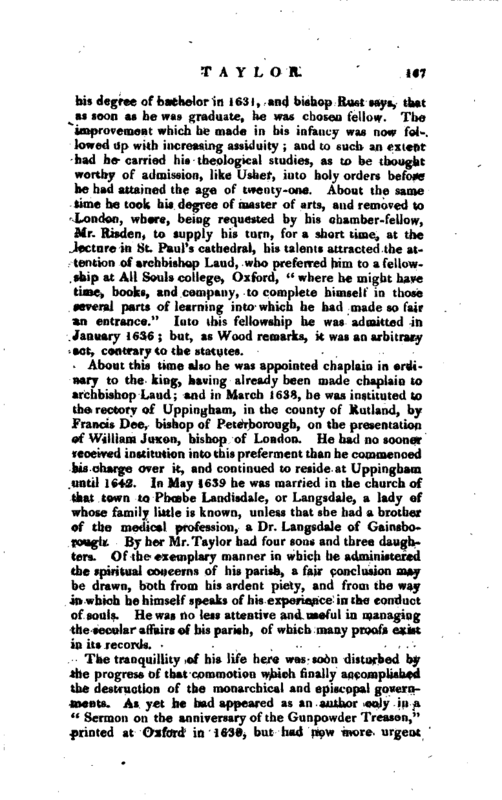 About this time also he was appointed chaplain 4n ordinary to the king, having already been made chaplain to archbishop Laud; and in March 1638, he was instituted to the rectory of Uppingham, in the county of Rutland, by Francis Dee, bishop of Peterborough, on the presentation of William Juxon, bishop of London. He had no sooner received institution into this preferment than he commenced his charge over it, and continued to reside at Uppingham until 1642. In May 1639 he was married in the church of that town to Phoebe Landisdale, or Langsdale, a lady of whose family little is known, unless that she had a brother of the medical profession, a Dr. Langsdale of Gainsborough. By her Mr. Taylor had four sons and three daughters. Of the exemplary manner in which he administered the spiritual concerns of his parish, a fair conclusion may be drawn, both from his ardent piety, and from the way in which he himself speaks of his experience in the conduct of souls. He was no less attentive and useful in managing the secular affairs of his parish, of which many proofs exist in its records. The tranquillity of his life here was soon disturbed by the progress of that commotion which finally accomplished the destruction of the monarchical and episcopal governments. As yet he had appeared as an author only in a “Sermon on the anniversary of the Gunpowder Treason,” printed at Oxford in 1638, but had now more urgent | occasion to employ his pen, while argument seemed to promise any effect, in defence of the church. With this view he produced in 1642, his “Episcopacy asserted,” which was published at Oxford by the king’s command, and ran its course with the works of bishop Hall and others on the same subject. This is dedicated to his friend and patron, sir Christopher Hatton, afterwards lord Hatton of Kirby, whose son he afterwards assisted in preparing an edition of the Psalms, according to the authorized version. This appeared in 1644, and was entitled “The Psalter of David, with Titles and Collects according to the matter of each Psalm, by the right hon. 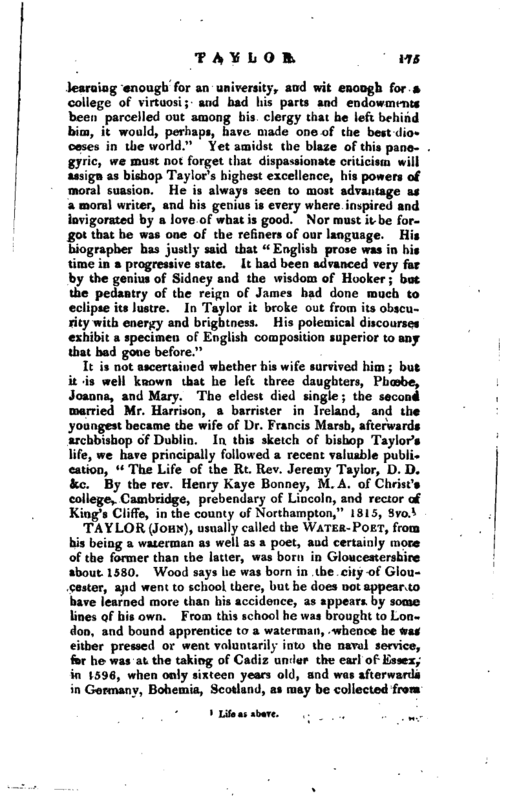 Christopher Hatton.” His biographer says, that “all that is new in this publication was the production of Taylor. The preface, which bears his name, and the titles and collects adapted to each psalm, were the efforts of his mind.” This was a very popular work during the whole of the seventeenth century; but in the tenth edition, now before us, Lond. 1683, both Hatton’s and Taylor’s names are omitted from the title and preface, yet it appears even then to have been sold by the name of “Ration’s Psalms,” as the binder has so titled it on the back. In August 1642, when the king went to Oxford, Taylor was called upon to attend him in his capacity of chaplain, and was there honoured with a doctor’s degree, but probably lost his living, as after this time there is no trace of him at Uppingham; yet though it was sequestered, it does not appear that he relinquished his claim to it, nor, in point of fact, does any rector occur between his departure and the year 1661, when John Allington signs himself as such. Being one of the king’s retinue, Dr. Taylor probably accompanied the army, but there are no distinct particulars of his progress at this unfortunate period, and it is probable that he retired into Wales, either in the summer of 1645, or the spring of the following year. We can, however, more certainly trace his pen in the controversies of the times. 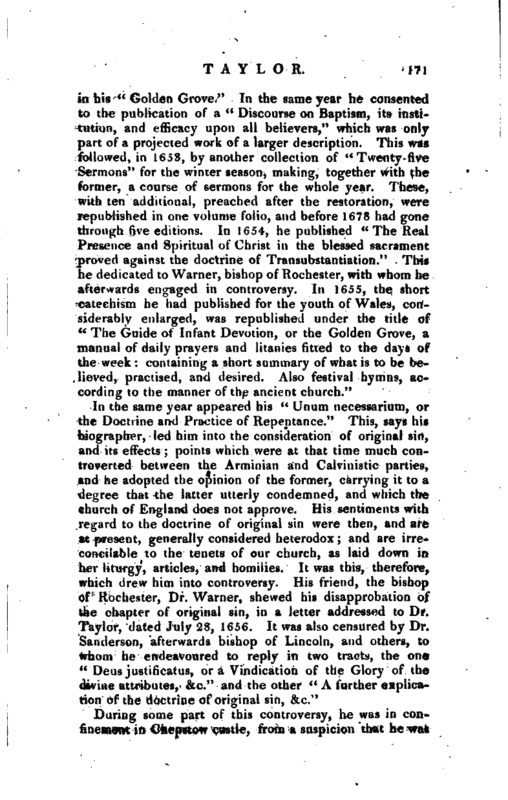 When the assembly of divines at Westminster published their “Directory,” which abolished the usual forms of prayer, Dr. Taylor published “A Discourse concerning. Prayer extempore, or by pretence of the Spirit, in justification of authorised and set forms of Liturgie.” This was printed in 1646, but without the place being specified. It had been preceded, probably about 1644-, with “An apology for authorised and set forms of Liturgy | against the pretence of the Spirit.” They form a very able defence of liturgy. While in Wales, he was obliged to maintain himself and family by keeping school, at Newton, in Carmarthenshire, where he was assisted by Mr. William Wyatt of St. John’s college, Oxford, and they jointly produced, in 164-7, “A new and easie institution of Grammar,” London, 12mo. This scarce little volume has two dedications, one in Latin to lord Hatton by Wyatt, the other in English, by Taylor, addressed to lord Hatton’s son. 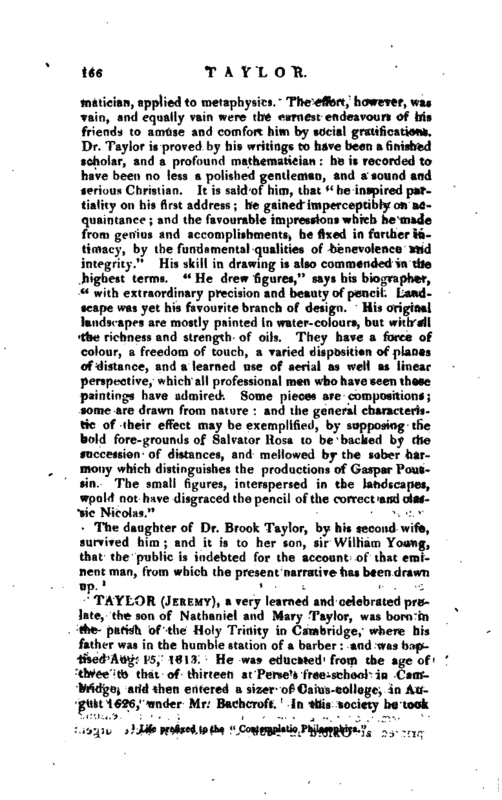 The eminence of Dr. Taylor’s learning, and the integrity of his principles procured him scholars, who, as his biographer says, “having, as it were, received instruction from this prophet in the wilderness, were transplanted to the universities.” He found also a generous patron in Richard Vaughan, earl of Carbery, who resided at Golden Grove, the seat of his ancestors, in the parish of Llanfihangel Aberbythick, near Llandillo Fawr, in Carmarthenshire. 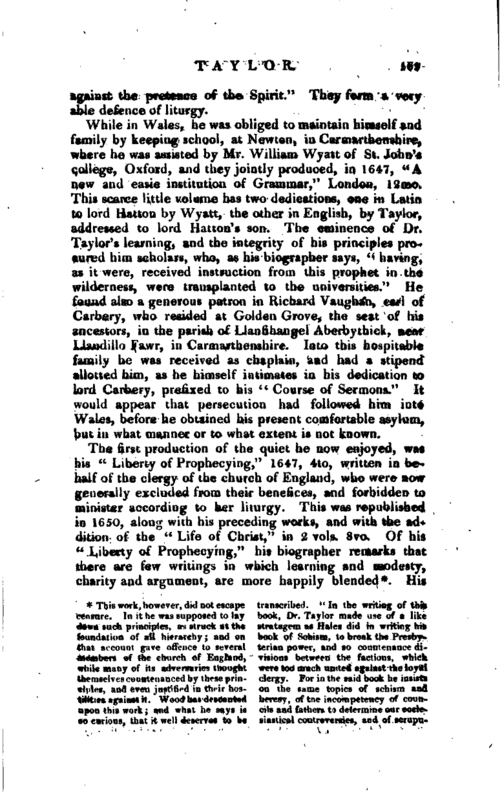 Into this hospitable family he was received as chaplain, and had a stipend allotted him, as he himself intimates in his dedication to lord Carbery, prefixed to his “Course of Sermons.” It would appear that persecution had followed him into Wales, before he obtained his present comfortable asylum, but in what manner or to what extent is not known. lous consciences; and urgeth far more cogent arguments than Mr. Hales did, but still had prepared his Zo$o $ap>-uxxo, or Antidote to prevent any dangerous effect of his discourse for the judicious tender may perceive surh a reserve, though it lie in ambuscado, and is compacted in a narrow compass, as may easily rouse those troops, which began too soon to cry victoria, and thought of nothing els* but dividing the spoil. And if the learned anthor (Hales) did thisaud uas blameless, the goodness of the end in such cases denominating the action, I see no cause why our author, whose ends were for the restoring of peace, seeing he represented the causes of the war so frivolous and inconsiderable, ought to be represented as a criminal or adversary." If the fad be rightly alledged, the excuse certainly is not valid. In the mean time, Dr. Taylor’s book has ever been admired and those, who have not approved of many things advanced in it, have allowed it to abound, as indeed all his works do, with sense, wit, and the profoundest learning. His | next production was “The Great Exemplar,” the purpose of which he states to be, “to advance the necessity, and to declare the manner and parts of a good life; to invite some persons to the consideration of all the branches of it, by intermixing something of pleasure with the use; and others by such portions, as would better entertain them than a romance.” In 1650 he published one of his most popular and standard works, “The Rule and Exercises of Holy Living,” of which the twenty. eighth edition was published in 1810. In Oct. 1650, he lost his valuable patroness the countess of Carbery, and delivered a funeral sermon on that melancholy occasion, which was published the same year. 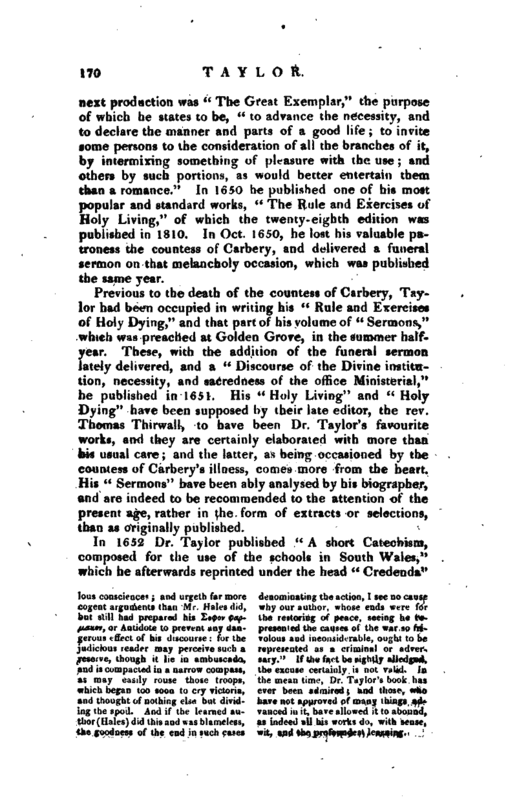 Previous to the death of the countess of Carbery, Taylor had been occupied in writing his “Rule and Exercises of Holy Dying,” and that part of his volume of “Sermons,” which was preached at Golden Grove, in the summer halfyear. These, with the addition of the funeral sermon lately delivered, and a “Discourse of the Divine institution, necessity, and sacredness of the office Ministerial,” he published in 1651. 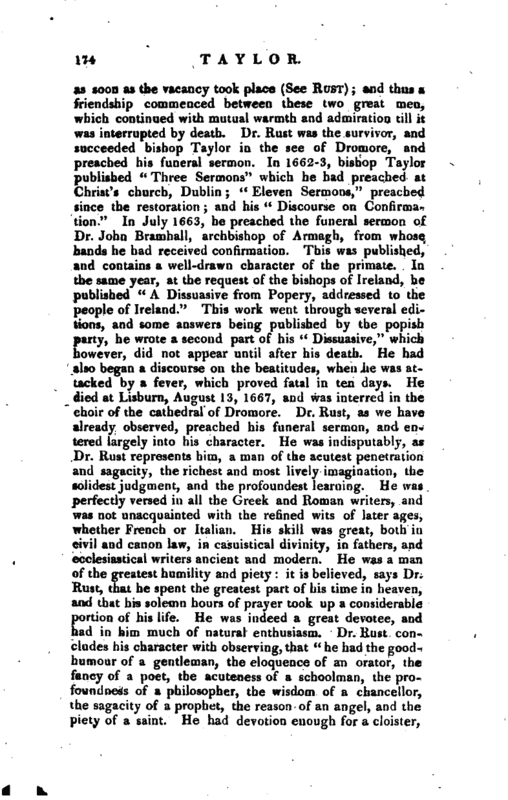 His “Holy Living” and “Holy Dying” have been supposed by their late editor, the rev. Thomas Thirwall, to have been Dr. Taylor’s favourite works, and they are certainly elaborated with more than his usual care; and the latter, as being occasioned by the countess of Carbery’s illness, comes more from the heart. His “Sermons” have been ably analysed by his biographer, and are indeed to be recommended to the attention of the present age, rather in the form of extracts or selections, than as originally published. During some part of this controversy, he was in confinement in Chepstow castle, from a suspicion that he was | concerned in the insurrection of the royalists at Salisbury, but appears to have been released after the autumn of 1656, when he was at home, and lost two of his sons by the small pox. After this, in the beginning of 1657, he went to London, having determined to relinquish altogether hfs situation in Wales; and officiated to a private congregation of loyalists, but not without great danger from the prevailing p.my. 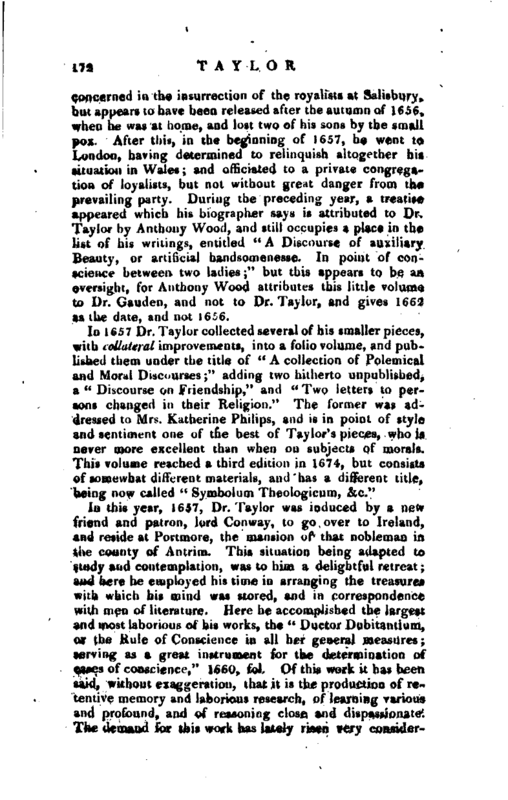 During the preceding year, a treatise appeared which his biographer says is attributed to Dr. Taylor by Anthony Wood, and still occupies a place in the list of his writings, entitled “A Discourse of auxiliary Beauty, or artificial handsornenesse. In point of conscience between two ladies;” but this appears to be an oversight, for Anthony Wood attributes this little volume to Dr. Gauden, and not to Dr. Taylor, and gives 1662 as the date, and not 1656. In this year, 1657, Dr. Taylor was induced by a new friend and patron, lord Conway, to go over to Ireland, and reside at Portmore, the mansion of that nobleman in the county of Antrim. This situation being adapted to study and contemplation, was to him a delightful retreat; and here he employed his time in arranging the treasures with which his mind was stored, and in correspondence with men of literature. Here he accomplished the largest and most laborious of his works, the “Ductor Dubitantium, or the Rule of Conscience in all her general measures; serving as a great instrument for the determination of cases of conscience,” 1660, fol. Of this work it has been said, without exaggeration, that it is the production of retentive memory and laborious research, of learning various and profound, and of reasoning close and dispassionate. The demand for this work has lately risen very | considerably; and what we can remember holding a very inferior, if any place, in sale catalogues, is now a prominent article with a handsome price. It is undoubtedly a very interesting work to men that delight in the exercise of the reasoning power, but its real utility in satisfying scruples of conscience is, we think, not quite so apparent. This work was dedicated to Charles II. the restoration having taken place. 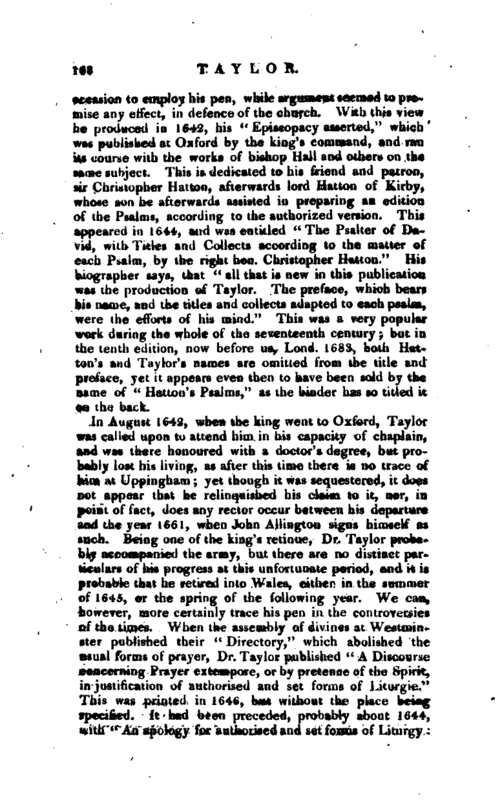 Dr. Taylor appears to have left Ireland early in the spring of 1660, and arriving at London, subscribed the declaration of the nobility and gentry that adhered to the late king in and about that city, and when the vacant sees came to be filled up, bishop Lesley was promoted to that of Meath, and Dr. Taylor succeeded him in that of Down and Connor. While yet bishop-elect, and before he left London, he published his book on the sacrament, entitled “The Worthy Communicant, &c.” He then went over to Ireland, and was consecrated, and about the same time he was chosen vice-chancellor of the univerity of Dublin, an office which he held until his death. On opening the parliament in May 1661, he preached before the members of both houses at St. Patrick’s, and his sermon was printed at London in 4to. 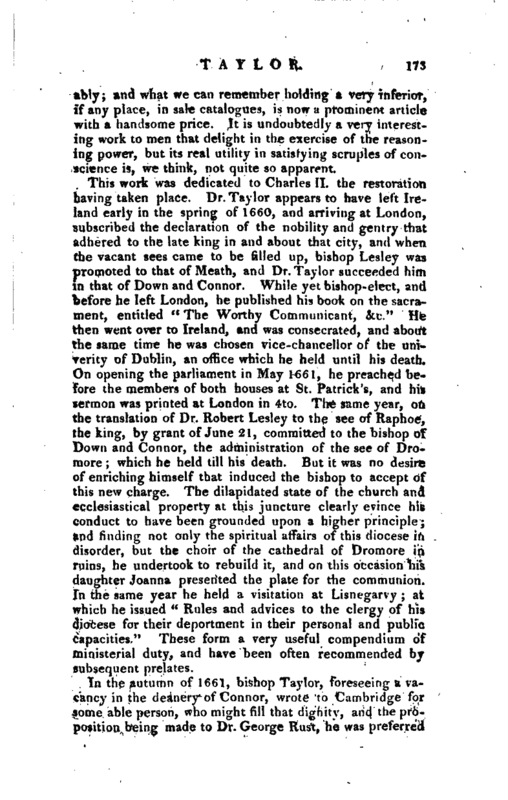 The same year, on the translation of Dr. Robert Lesley to the see of Raphoe, the king, by grant of June 21, committed to the bishop of Down and Connor, the administration of the see of Dromore; which he held till his death. But it was no desire of enriching himself that induced the bishop to accept of this new charge. The dilapidated state of the church and ecclesiastical property at this juncture clearly evince his conduct to have been grounded upon a higher principle; and rinding not only the spiritual affairs of this diocese in disorder, but the choir of the cathedral of Dromore in ruins, he undertook to rebuild it, and on this occasion his daughter Joanna presented the plate for the communion. In the same year he held a visitation at Lisnegarvy; at which he issued “Rules and advices to the clergy of his diocese for their deportment in their personal and public capacities.” These form a very useful compendium’ of ministerial duty, and have been often recommended by subsequent prelates.